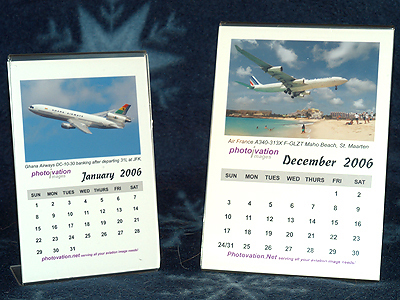 With 2006 just around the corner you'll want to order one or more of Photovation's aviation calendars. Choose from a variety of popular themes or, if you prefer, pick specific images in Photovation's extensive library, or ship us your images and have your own "one of a kind" calendar printed. Display on your desk using a bent plastic frame or hang from the fridge with a magnet!